NASA's planned Phoenix Mars Scout will land in icy soils near the north polar permanent ice cap of the Red Planet and explore the history of water in these soils and any associated rocks. 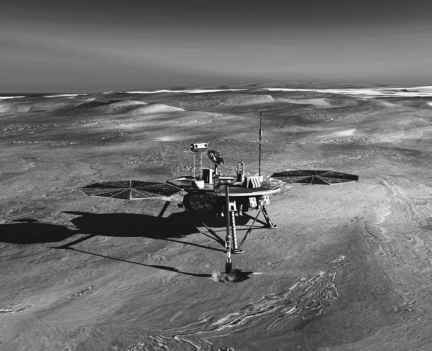 This sophisticated space robot serves as NASA's first exploration of a potential modern habitat on Mars and opens the door to a renewed search for carbon-bearing compounds, last attempted with the Viking 1 and 2 lander spacecraft missions in the 1970s. 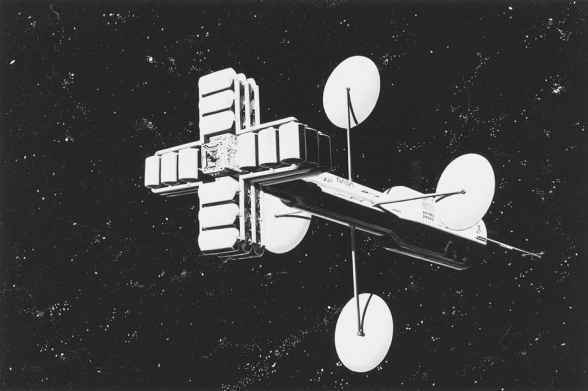 The Phoenix spacecraft is currently in development and will launch in August 2007. 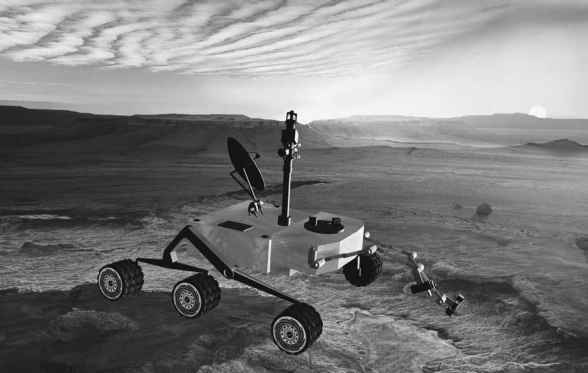 The robot explorer will land in May 2008 at a candidate site in the Martian polar region previously identified by the Mars Odyssey orbiter spacecraft as having high concentrations of ice just beneath the top layer of soil. Phoenix is a fixed-in-place lander, which means that it cannot move from one location to another on the surface of Mars. Rather, once the spacecraft has safely landed, it will stay there and use its robotic arm to dig the ice layer and bring samples to its suite of on-deck science instruments. These instruments will analyze samples directly on the Martian surface, sending science data back to Earth via radio signals, which will be collected by NASA's Deep Space Network. The Phoenix spacecraft's stereo color camera and a weather station will study the surrounding environment, while its other instruments check excavated soil samples for water, organic chemicals, and conditions that could indicate whether the site was ever hospitable to life. Of special interest to exobiologists, the spacecraft's microscopes would reveal features as small as one one-thousandth the width of a human hair. The Phoenix lander's science goals of learning about ice history and climate cycles on Mars complements the robot spacecraft's most exciting task—to evaluate whether an environment hospitable to microbial life may exist at the ice-soil boundary. One tantalizing question is whether cycles on Mars, either short-term or long-term, can produce conditions in which even small amounts of near surface water might stay melted. As studies of arctic environments on Earth have indicated, if water remains liquid only—even just for short periods during long intervals—life can persist, if other factors are right. three times as massive as either Spirit or Opportunity. The Mars Science Laboratory will collect Martian soil samples and rock cores and analyze them on the spot for organic compounds and environmental conditions that could have supported microbial life in the past or possibly even now in the present. graphic evidence for recent gullies, possibly cut by flowing water, there is no evidence for liquid water currently at the surface. The icy, northern polar region of Mars is interesting to exobiologists because that is where the (frozen) water is—and where there is water (even in the form of ice), there could be life, existent or extinct. Drawing upon experience with some of the colder parts of Earth, as found, for example, in Iceland or Antarctica, scientists know that water can be stored as a mixture of frozen mud and ice in a layer of permafrost and beneath a permafrost layer, as liquid groundwater. So even if the ancient surface water on Mars evaporated, there may still be substantial reservoirs of water, in either liquid or frozen form, beneath the planet's surface. To get to the zone where frozen water, and possibly dormant life might be present on Mars, scientists anticipate that they will have to drill or penetrate to a depth of about 660 feet (200 m). 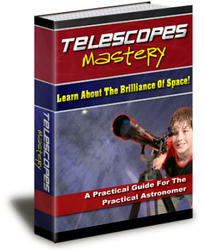 In all likelihood, any liquid water (if present) will be even deeper below the surface. Deep subsurface access on Mars presents unique engineering challenges. One approach to reach below the polar-region surface on Mars is to use a system called the cryobot ice-penetrating robot probe. After a successful soft landing in the treacherous northern polar regions of Mars, the lander spacecraft would activate the ice-penetrating probe it carries. By heating the torpedo-shaped nose of the cryobot, the device is pulled by gravity down through the tunnel that the probe melts in the ice. Instruments carried within the body of the cryobot automatically take measurements and perform analyses of the gases and other materials encountered. 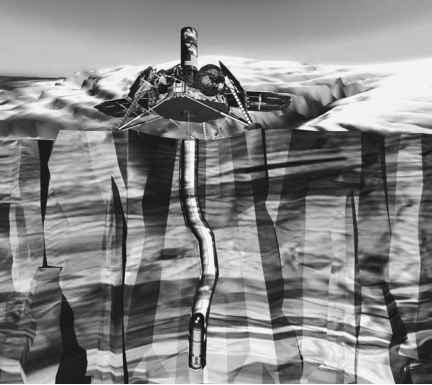 As a smart robot, the cryobot probe will use innovative heating and steering features to maneuver around subsurface obstacles adroitly (primarily large rocks). Endowed with a high level of machine intelligence, the cryobot probe even has the ability to alter its downward course slightly to adjust for subsurface conditions or to exploit unexpected scientific opportunities, such as encountering a liquid-water aquifer deep beneath the frozen surface. The cryobot moves through ice by melting the surface directly in front of it and allowing the liquid to flow around the robot probe and refreeze behind it. The probe takes measurements that characterize the encountered environment and then relays the scientific data up to the lander craft through a thin cable that is spooled out from its aft section as the robot probe descends into the frozen material. For ice layers of more than a mile (1.6 km) or so thick, it may be more practical to have the robot probe communicate back to the lander at the surface through a series of miniradio-wave transceiver relays, which the probe deposits in the resolidified material as it descends. more effective than conventional drilling techniques because it uses less power than mechanical cutting. Furthermore, since the cryobot travels downward in a self-sealing pathway through the ice, there is no deeply drilled hole that must be encased with massive steel tubes to prevent cave-in or collapse. Finally, the use of semiautonomous steering and fault management allow the probe to reduce the risk of becoming trapped by unanticipated subsurface conditions or obstructions. As mentioned in chapter 5, the cryobot would also be an ideal robot system for penetrating the ice crust of Europa.